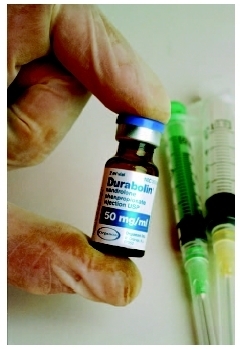 Bottle of the injectable anabolic steroid, Durabolin. "Anabolic Steroids." MedlinePlus. Available online at http://www.nlm.nih.gov/medlineplus/druginfo/uspdi/202035.html. "Steroids (Anabolic-Androgenic.)" National Institute on Drug Abuse. Available online at http://www.nida.nih.gov/Infofax/steroids.htm/ (accessed December 18, 2004).